I don’t know about you but I am SO excited about the changes that have been made to the blog. We are not finished but I am thrilled to have a more customize blog for my recipes. Thanks to Michelle Guzman for her patience, time and creativity! Looking for a specific type of recipe?? Be sure to check out my “Recipe” Page (screen shot pictured above) to sort my recipes by category and recipe type. I hope this feature helps you find what you are looking for. After all, I have over 270 recipes on my blog, not counting the ones in my cookbooks, Satisfying Eats & Comforting Eats. Purchase them HERE. Be sure you stay connected and get all of my latest recipes and advice. How can you stay connected?? Subscribe to my blog via email. This ensures that you don’t miss a recipe or giveaway. Since Facebook doesn’t show you all of my posts, this is the only way to completely stay connected! Follow me on Pinterest. I have created several boards of my favorite tips and recipes. Subscribe to my channel on YouTube. Be sure to check out the videos I already have posted (like a how-to video for grain-free pie crust and stuffed burgers). Get a sneak peak at new recipes and family life on Instagram. Cheese-Use your favorite cheese. I prefer sharp cheddar but you could also use pepper jack for a little extra punch of heat. Sweetener– Use any sweetener you choose to taste. I made this recipe with just a hint of sweetness but if you want more, feel free to add it. For questions about sweeteners, be sure to check out THIS post. Heat– Jalapenos vary in heat intensity. When baked, some of the heat cooks out. If you don’t like a lot of heat, use 2 jalapenos, being sure to remove the seeds and pith. If you like a little heat, use 3 jalapenos. For extra heat, leave in the seeds! 🙂 If you want, you can always omit the heat. “Corn” Substitute– Since it is summertime and local farms are stocked with TONS of squash, I decided to use yellow squash in this recipe. It also makes the bread nice and moist and it even kinda looks like corn (which was my intention). You could also use zucchini or really any other vegetable you would like. If you decide to leave out the veggie, be sure to add an extra tablespoon of dairy. Fat of choice– I actually used part bacon grease and part butter in this recipe but it really doesn’t matter. Also feel free to use expeller coconut oil. Milk– Use whatever milk you choose. Buttermilk, regular milk, heavy cream, coconut milk or unsweetened almond milk will all work. My favorite is a combination of 2 tbsp. regular milk along with 2 tbsp. sour cream. Baking Vessel–I used an 8 inch cast iron skillet but you could easily make these in a muffin pan or corn stick mold. You can also make this in an 8-inch cake pan. I just like using the cast iron to get that traditional bottom crust! Dairy-Free– If you can’t have dairy, feel free to omit the cheese and use bacon grease (preferably from pastured animals) or expeller pressed coconut oil. *I used 2 tbsp. of milk and 2 tbsp. of sour cream. Preheat oven to 350 degrees F. Add 1 tbsp. of the butter (or bacon grease) to a small (8-inch) cast iron skillet and place the skillet in the oven to preheat. In a small frying pan, add the remaining butter, squash, jalapenos and salt. Saute over medium heat for 2-3 minutes and then turn off the heat and set aside to cool. To a medium bowl add the dry ingredients. Blend well with whisk. Then add the vinegar and remaining ingredients including the cheese. 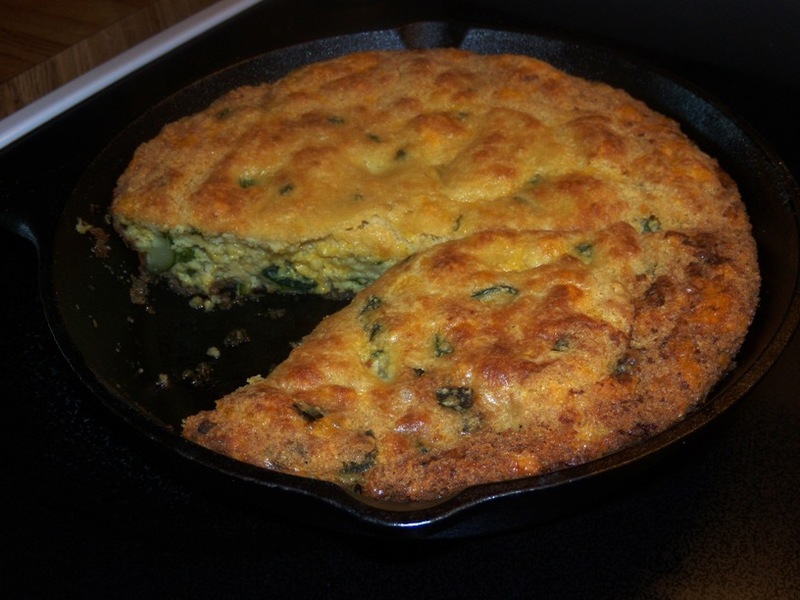 Stir well and then fold in the squash and jalapenos to the "corn" bread batter. Taste for sweetness and salt and adjust if needed. Carefully remove the preheated skillet from the oven and pour in batter, spreading the batter to cover the bottom of the skillet. Bake for about 20 minutes or until the "corn" bread is golden brown. Serve warm with salted butter. The new look is great. Very crisp and clean. So far very easy to use, and search for recipes. I could NOT wait to make this corn bread! I used zucchini (the store was out of yellow squash – imagine that). It tastes amazing!!! Thank you, Melissa for yet another winning recipe and one which I will be making over and over. Aura, if you don’t have squash or zucchini you could leave it out. I used the squash to mimic corn but you could omit if necessary or use 1/2 small onion for a little texture. I really like how your recipes and their ingredients are portioned. I’m always disappointed when I find a recipe I want to try but then read that it requires like 3 cups almond flour and 8 eggs or something ridiculous like that, ha! Yours always have the right amount: enough to be a really good treat and feed everybody but also keeps my family’s nut flour and dairy consumption in moderation, not to mention money saved on ingredients. Thanks for all the work you do! I have made this a couple of times. It was delicious. However, turned out a little soggy, I think because of the squash. I’m going to try next time without the squash.